This morning in New Delhi, Qualcomm is taking the wraps off of their latest entry-level, high-volume SoC, the Qualcomm 205 SoC. 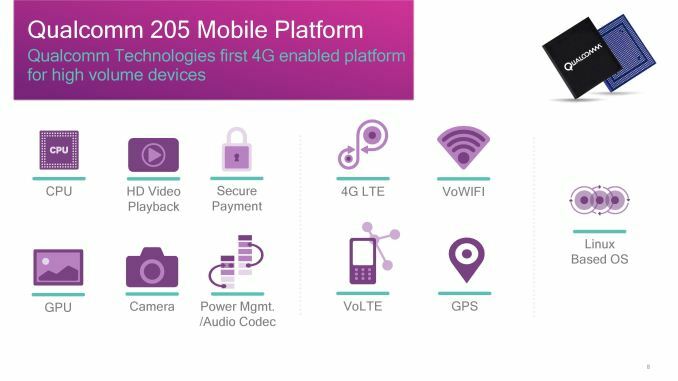 The cornerstone of the Qualcomm 205 Mobile Platform – and keeping in mind last week’s renaming of Qualcomm’s product stack – the 205 Platform is being launched as Qualcomm’s new entry-level SoC for emerging markets. Qualcomm’s focus on this latest 200-series SoC is bringing an LTE-enabled SoC down to its lowest price point yet, ultimately aiming to get LTE into the sub-$50 mass-market feature phones that are popular in these markets. From a technical perspective, Qualcomm has offered LTE in the 200 series SoCs since the 210 SoC in 2014. However this was on a slightly more premium quad-core CPU design, whereas Qualcomm’s cheapest SoCs are even simpler dual-core designs. The difference comes down a fraction of a dollar, but for emerging markets looking to push out to LTE – and with many of those markets subsidizing phones – even the cents matter. So now Qualcomm is rolling out a dual-core design with LTE, offering an even more basic design than the 3G-only 208 or the LTE-equipped 210. At a high level, the specs are unremarkable and appropriately simplistic. We’re looking at a dual-core Cortex-A7 CPU running at 1.1GHz and paired up with an Adreno 304 GPU, and, most importantly, one of the company’s X5 LTE modems. The X5 is a basic modem design that offers up to LTE Cat 4 speeds (150Mbps down/50Mbps up), which is more than sufficient for Qualcomm’s goals with LTE for emerging markets. Dual-sim functionality is present, as is VoLTE and VoWiFi as well. Video encode/decode are very basic, offering 720p30 decode and 480p30 encode, with a display controller capable of driving just a VGA (640x480) display, all of which is a notable reduction from the 208/210. The Hexagon DSP has been removed as well, saving further die space. Even the chip itself is designed to save a few pennies on implementation; it’s pin-compatible with the 210/208 so that it can be dropped into existing designs. Qualcomm’s big push for LTE connectivity in entry-level phones in India and other emerging markets comes as the company expects both consumers and carriers in those markets to make the transition over to LTE, which in turn means phone manufacturers are in need of a cheap platform that can handle LTE. 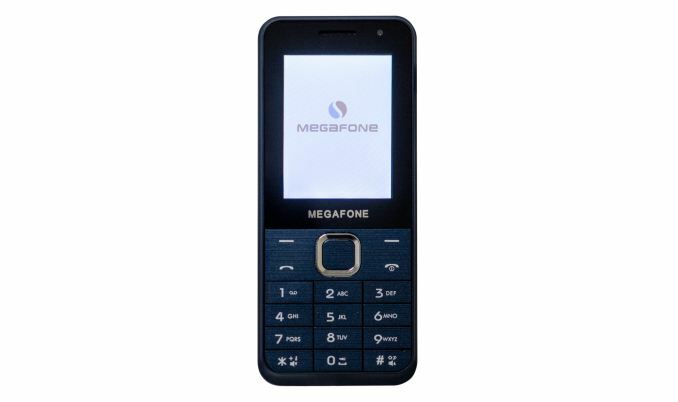 Though the definition of what exactly a feature phone is in 2017 is a bit muddled – the form factor seems to be the only defining element when even the OSes are now full-fledged systems based on ASOP and other Linux projects – they remain the cheapest phones, and Qualcomm expects them to benefit from LTE in similar ways as smartphones have over the last several years. Underpinning all of this is of course the massive spectrum efficiency gains in LTE versus 3G & 2G communication protocols, which increase the bandwidth available in a given area even without a larger number of towers. Otherwise Qualcomm expects the use cases for feature phones to be many of the same ones as smartphone users already do, if only on a smaller scale: social media, video streaming, etc. Meanwhile, one claim that particularly caught my attention is that Qualcomm is expecting to be able to get 45 day standby out of 205 phones; while 205 is of course designed for low power operation, with a 2000mAh battery this works out to a standby power consumption of just 6mW. Finally, Qualcomm is noting that the 205 SoC and its associated software were all developed in India, as part of fulfilling the country’s Make in India initiative, which at a couple of years old now, is intended to encourage manufacturers to invest in manufacturing within the country rather than importing finished products. While Make in India and the country’s associated attempts to encourage internal manufacturing have not always been well received – Apple and others have balked at the concept at times – it has been successful in driving semiconductor companies like Qualcomm towards developing entry-level hardware in the country. Though in Qualcomm’s case, the company has operated a development center for a lot longer than just the last couple of years. 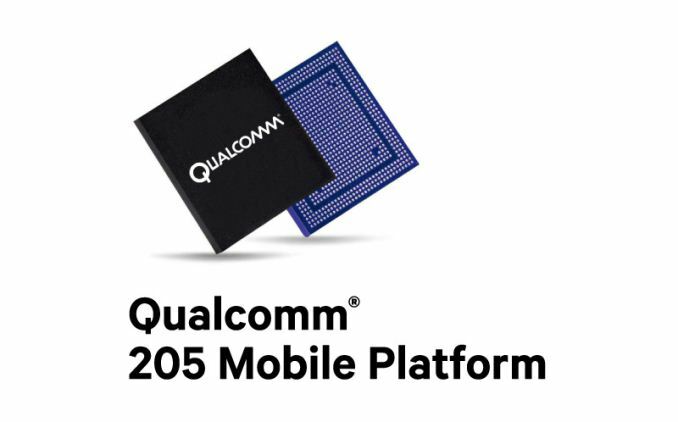 Wrapping things up, Qualcomm is shipping the 205 Mobile Platform today. 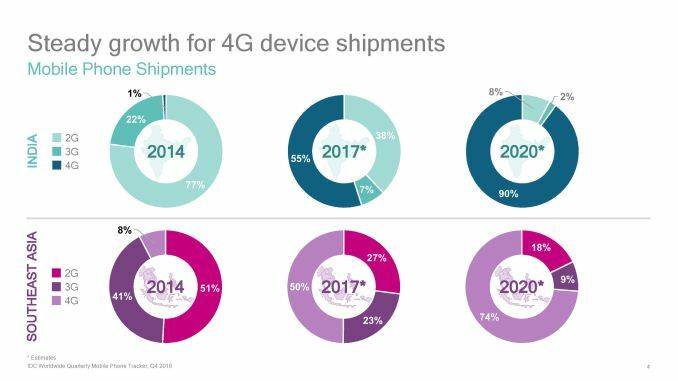 Phones based on the platform will be showing up quickly thereafter, with the first devices expected next quarter.